A waterspout at a castle has been described as "unexpected" and "wonderfully rude" by staff who have documented the property's gargoyles. Believed to be a female fertility symbol, it was among stone carvings that decorated the upper walls of Craigievar Castle in Aberdeenshire. The Royal Commission on the Ancient and Historical Monuments of Scotland (RCAHMS) made a study of the carvings. Images taken of them have been uploaded onto the RCAHMS' website. A book about the stonework and the study made during a major restoration of the National Trust for Scotland (NTS) property has also been published. Records of the Craigievar carvings join data the RCAHMS has gathered on rock art, sculptures and also Pictish carvings found across Scotland. Commission staff carried out its work at Craigievar in partnership with NTS between 2007 and 2009, recording the 17th Century carved cannons, waterspouts and gargoyles fixed to the castle's walls. The waterspout listed as number 394 is thought to be a fertility symbol. 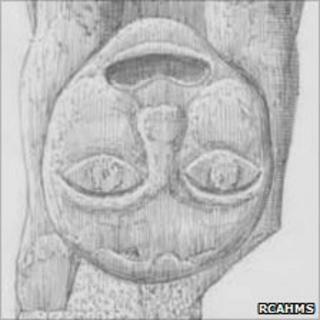 The RCAHMS said it was similar to medieval Celtic carvings known as Sheela na Gigs found in Argyll and in the west of Ireland. In the new book, the commission said it was the "most curious and unexpected image on the castle" and "wonderfully rude". It was removed from the castle's walls and put on display inside the building because of its fragile state. Carved stone cannons that feature winged dragons, thistles and ornate patterns were also recorded at Craigievar, along with its gargoyles. John Borland, a survey manager and illustrator with RCAHMS, said stone masons working on the castle in the 1600s had turned their hands to carving in soft sandstone and hard granite. In addition to a photographic and written records, Mr Borland also produced sketches of the carvings. He said: "The gargoyles are a very odd collection of carvings. "All have this little loop, a shot hole, through which muskets could be fired down through if there was an enemy at the door, but it is unlikely they were used for this. "Some of the images are animalistic and could be related to the castle's family heraldry." Mr Borland said others were human faces, while one was of a horned devil. New cannons were made during the £1m restoration work by NTS to replace a number of missing original features.